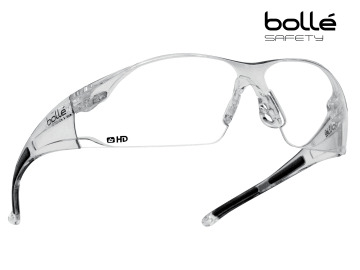 The Bolle RUSH Safety Glasses are lightweight protective glasses with upper protection from the frame. They offer a panoramic visual field, with a modern design that is comfortable to wear. The lenses have an anti-scratch, anti-fog coating, and the frame has anti-slip temples. Supplied with an adjustable cord. **PLEASE NOTE** That during extreme changes in temperature you may experience some slight fogging. 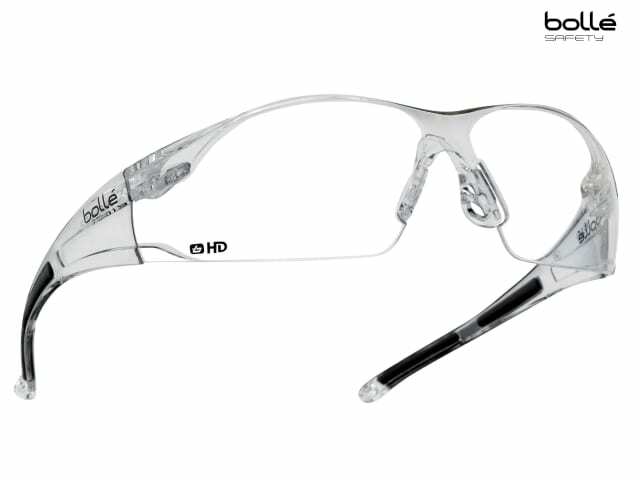 These Bolle RUSH Safety Glasses have Clear HD lenses. This is revolutionary coating for exceptional clarity and light transmission. The HD coating can be used for every type of job except those that require solar protection for industrial use. Unlike any other lens, wearers forget they are protected by the HD coating. Its visible light transmission rate is 96% compared with 92% for conventional clear lenses. Featuring a hydrophobic coating as standard, HD is a real polymer barrier and resists water and dirty marks. Lens Type: Clear HD, Hydrophobic, Anti-Fog and Anti-Scratch. Lens Conforms to: EN170-UV 2C-1.2.